Today we continue looking at angst in America, the financial worries that so afflict us here in the world�s largest economy and by extension in much of the developed world. We may be the envy of the world in some ways, but we also have no shortage of stress. 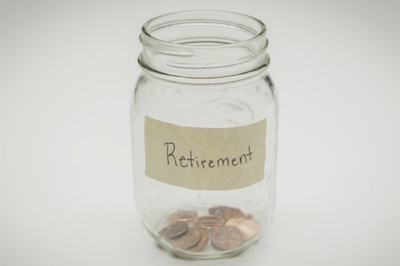 Today we�ll look at some data on retirement savings � or lack thereof. Let�s start by backing up a little bit. I�m not the only one talking about financial anxiety. Last week I ran across a survey from NerdWallet on this very issue. They engaged the Harris Poll to ask 2,000 Americans of all ages about their biggest financial concerns. 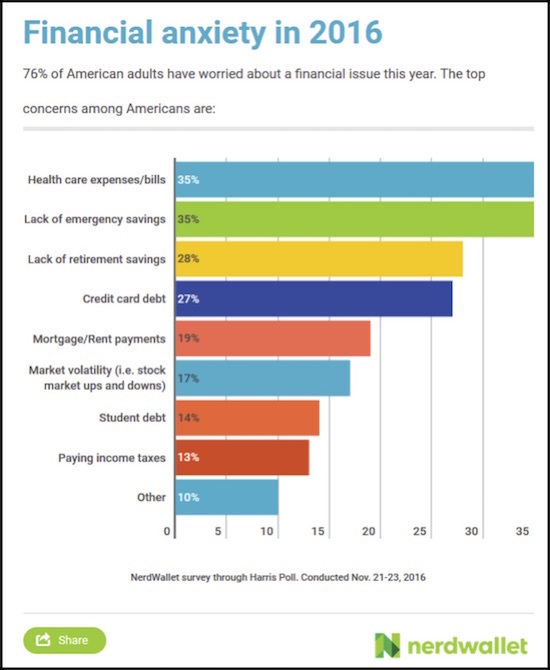 Here�s a chart showing the top worries. The biggest worries are healthcare expenses, lack of emergency savings, and lack of retirement savings. Yet only 28% worry they lack retirement savings? Compare this with what we know about people�s actual savings, and that number is far too low. We can see in another recent survey by GOBankingRates.com that more people should be worried about their retirement. The NerdWallet survey also shows that 13% have accumulated $300,000 or more in retirement savings. I am skeptical of that number, too, unless it includes the cash value of defined-benefit plans held by government employees. And for them that value is mostly an illusion; for many of them, their plans can�t possibly deliver anything near what the workers were promised. But that�s another subject. How much do we Americans really have saved? A Motley Fool article last year, citing data from the Employee Benefit Research Institute, looked at actual Individual Retirement Account balances. As of year-end 2013, 20.6 million individuals held a total $2.46 trillion in IRA accounts. Some of those unique individuals are each other�s spouses, so the number of family units would be lower. Do the math and we find that the average IRA holder�s balance was around $120,000 as of three years ago. But remember, the average IRA holder is not the average American. If only 20.6 million of us have IRAs, then over 300 million of us don�t have them. 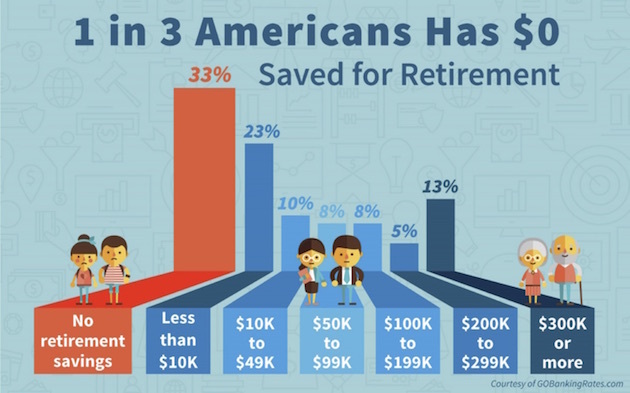 Some no doubt have other retirement vehicles, like 401(k)s. But this still suggests that a large plurality of Americans, and maybe a majority, have little or nothing saved for retirement. This shortfall is a problem, and not just for them. It�s easy for those of us in the Protected Class to think the masses will be fine. They at least get Social Security and Medicare, enough to keep them out of poverty, right? No, not right. We know this straight from the horse�s mouth, too. The Social Security Administration publishes a very handy annual �Fact Sheet.� As is the case with most bureaucracies, the SSA�s goal is partly to demonstrate how indispensable they are, but in the process they tell us a few things that should make us uncomfortable. In 2017, the average monthly retiree benefit is $1,360. Multiply that by 12 months and divide by 52 40-hour weeks, and living off Social Security is equivalent to being a full-time worker who earns $7.85 an hour (and remember, this is the average; many people receive less). Social Security benefits are worth a little more than the same amount in wages, net of taxes, but they still aren�t much. Guesstimating the tax differential suggests an equivalent hourly wage of about $8.50 an hour. Social Security�s fact sheet also says benefits represent about 34% of the elderly population�s income � but that number is heavily skewed in favor of the wealthy. Among retirees, 21% of married couples and 43% of unmarried persons rely on Social Security for 90% or more of their income. Currently, 41.2 million retired workers and 3 million dependents receive Social Security benefits. So that means 15 million or more retirees must be living on an income that�s meager by any definition. But at least they don�t have to worry about medical bills, you say; Medicare covers them all. Well, yes, it does cover them, but that�s not the same as covering their expenses. Copays and deductibles add up quickly unless you have supplemental insurance, which itself is expensive. Medicare recipients are responsible for 20% of hospital bills, and for these people even a short stay can wipe out months of income. Forty-one percent of Americans have no savings at all. An article in Forbes cites data that shows that just 37% of Americans have savings to cover an emergency that costs over $500. And understand, that is not just medical emergencies. What happens when your car breaks down? You have to get it fixed because you have to get to work. Having extensive experience with my seven children (and now seven grandchildren! ), I can tell you that emergency expenditures seem to be the norm, not the exception (at least in the Mauldin household). Now the kids are adults and trying to make it on their own, but there are still times when The Bank of Dad has to help out in emergencies. The Social Security fact sheet has some other chilling numbers. It says 51% of the private workforce has no private pension coverage. Those are presumably people who work in small businesses or are self-employed or �gig� workers. Confirming NerdWallet�s figure, Social Security says 31% of workers report they and/or their spouses have no savings set aside specifically for retirement. Depending on the survey, another 10% have less than $10,000. It wouldn�t take very long to run through someone�s entire savings, given a significant hospital stay or illness. Is Social Security sustainable? To listen to politicians, Social Security obligations will always be met. Then again, looking at the mathematics, at least for those just now approaching retirement age or younger cohorts, the reality may be different. By 2035, the number of Americans 65 and older will climb from about 48 million today to over 79 million. That�s the Baby Boomer impact. Currently there are 2.8 active workers for each Social Security beneficiary. It will be only 2.2 workers per beneficiary by 2035. Only 39% of Boomers have tried to figure out how much they need to have saved for retirement. Of those that have, a third did not include healthcare costs in their calculations. On average, Boomers estimate that healthcare will consume 23% of their income in retirement, compared to the 33% of income that those over 60 actually spend today. Fifty-nine percent of retirees expect Social Security be their major source of income, up from 42% five years ago. Divorce is becoming a major factor in retirement: 24% of divorced Boomers expect to be worse off in retirement than if they had not divorced. Roughly 16% of Americans are taking premature withdrawals from their retirement accounts, while 30% of Boomers have stopped contributing to their accounts. Simply put, most Baby Boomers will be down to subsistence living by the time they are 80, living on Social Security and other government benefits, with help from any capable children. The following graph puts the stark reality of Boomer retirement in perspective. There is a massive gap between what people expect to have during retirement and what they will actually have and be able to spend. The surprising thing, at least to me, is that there isn�t more angst in America than what we currently see. The basic facts that we just reviewed aren�t complicated, or even much disputed. Up until age 30 or so, it�s easy to think you will be young forever. Then reality sets in, and you know it�s time to grow up. Or at least that�s how it was for me � the line seems to be creeping higher. Why, then, do so few people save anything for retirement? Can people really be that oblivious? Depressingly to some of us, the answer is yes. We all have many different needs competing for our attention. We have to prioritize, and long-term needs often get lower priority than whatever need is pressing in the here and now. I recall a very depressing conversation I had with my fishing guide last year in Maine. He had had a job in one of the paper mills, but it had closed down. He had about $150,000 in his 401(k). He was taking out about $10,000 a year (and paying the penalty) just to survive. There were no other jobs in the area, other than what he could make from his work as a guide and from other part-time gigs, jobs all of his friends were competing for. I pointed out to him that by the time he was physically going to need to retire (as the work he was doing was pretty strenuous), if he kept hitting his 401(k), there would be nothing left. It was a very sobering conversation. Basically, he didn�t know what to do. Reality was that the expenses he faced simply to maintain his home and minimal lifestyle forced him to go to his savings. Paraphrasing Spock, the needs of the present outweigh the needs of the future. It�s also the case that stifling the temptation to indulge in short-term pleasures is an acquired skill. It doesn�t happen automatically. I think that skill comes mostly from seeing your own parents exercise fiscal discipline while you�re a child. Boomers who grew up in times of relative prosperity may not have felt the need to be frugal and may find it hard to do so. Still, I think most adults know on some level that retirement won�t take care of itself. They know they should be saving; they know what will happen if they don�t; and yet many still don�t do it � or can�t. That�s why, to varying degrees, surveys show that people are worried about retirement. You don�t worry about something unless you know it is both important and problematic. Is our national behavior really a surprise? Look at our diet and health indicators. As a nation, we eat too much and indulge in all kinds of unhealthy habits. If we can�t even take care of our bodies, then it figures that we�re not very good at financial planning, either. You�re probably an exception to that rule if you are reading this article, but the data shows that people like you are not the norm. Having said all this, it is not necessarily true that financially unprepared people don�t want to prepare. As I said above, we all have priorities. Median household income in the US is less than $60,000. That�s not much for a young parent faced with expensive housing, food, medical expenses, childcare, transportation, and all the rest, not to mention taxes. The average family making $60,000 pays about $7000 in taxes to the federal government and more, perhaps a lot more, depending on the state they live in. And it�s not just taxes; there are fees for everything � drivers licenses, car tags, deposits for utilities, and so on. Not to mention the occasional ticket from the police for some infraction. To the extent that people save at all, it will be for their children�s college fund rather than their own retirement. There�s a stereotype, not entirely imaginary, that some Americans have plenty of money but just choose to spend it frivolously. Such people do exist, and of course they�re responsible for their own decisions. But let�s not forget that we live in a consumerist culture filled with seductive marketers telling us to buy unnecessary things. Often, they succeed. You have every intention of saving some money at the end of the month, but something comes along that grabs your attention, and you absolutely must have it. Oh well, you can save a little more next month. 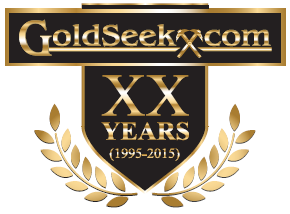 Speaking at conferences and reading your feedback, I�ve noticed a little subculture emerging in the last decade. It�s composed of people who, ahead of the 2008 crisis, saved their money, invested properly, and generally made all the right moves. I mean intelligent, educated, well-paid people. Then the financial crisis hit, and their retirement savings went up in flames. Having lost half of their assets, many sold to preserve what they could � just in time to miss the recovery. Did they make a mistake? Yes, obviously. Was it because they were dumb, selfish, or short-sighted? No, it was because they were human. The moves they made might have been right in other circumstances. Yet they ended up back at square one, having lost decades of hard work and financial progress, while the clock kept ticking. On paper, their situations look much like those of people of the same age who never saved anything, but they aren�t the same at all. I try to remember this before I assume things about people. Sidebar: My five-part series on tax reform and then this series on Angst in America have provoked an enormous number of comments from people telling me their personal stories. Some of them are truly heartbreaking. Good people, people with kids and families and responsibilities, simply caught up in tough circumstances and now faced with no good choices. I had a conversation this week with a close business associate who had to help his parents buy a home. Growing up in California, his family was quite comfortably middle-class. And then his father�s industry hit a devastating downturn; the father was laid off, and it was four years before he could get another job, by which time he had lost pretty much everything, and the family was now renting a home, which has become an expensive proposition in California. The only option was for my friend to help his parents move into a home near him at a much lower cost. His parents were lucky they had a son with the fina ncial wherewithal to do that; most Americans aren�t so fortunate. And we wonder why there is angst in America? Whatever the circumstances, millions of Americans are growing older and headed straight toward an unforgiving brick wall. They will reach their mid-sixties and find there is no pot of gold under the retirement rainbow. Social Security plus their own savings, if they have any, won�t be enough to finance the kind of leisurely golden years they saw their parents and grandparents enjoy. In historical context, this reality shouldn�t surprise any of us. The idea of capping off your life with a decade or two of carefree living didn�t exist before the 20th century, unless you were of royal lineage. Everyone else worked as long as they were physically able and died soon after they weren�t. That�s what was normal for most of human history, and it still is in places we rarely see on TV. If you aren�t worried about financing your retirement, you�re either very wealthy or very oblivious. You�re not oblivious if you�re one of my readers. So to the wealthy ones, congratulations. To everyone else� join the club. I know it may feel like you�re the only one worried about retiring, since you don�t get to look at your neighbor�s balance sheet, but you�re hardly alone. I�ve written before about the growing number of retirees who keep working right past 65 and even into their 70s. Twenty-five percent of Baby Boomers expect to work to at least 70 and beyond. If you ask them why, the answer is often that they enjoy their work and don�t want to stop. I�m sure that�s true for many. But I�d also bet many keep working out of necessity, no matter what they tell pollsters and friends. I don�t see anything wrong with this. I will be 68 later this year, and I�m still working as hard as I ever did, maybe more so if you count the total hours. Then again, I�m fortunate to have work that I enjoy and that is not too physically strenuous (except for the travel, which is starting to be more of a challenge). I tend to spend my �leisure time� reading and researching rather than watching TV. Those factors, along with a pretty good diet and exercise program, augmented by some medical anti-aging breakthroughs that I think are coming quite soon, should hopefully enable me to stay productive for many more years. That�s a good thing (true confession here), because the lifestyle I currently enjoy would not be possible in a traditional retirement situation. I would certainly not be destitute, and no one would feel sorry for me, but I am about as happy as I�ve ever been with my current situation. Let�s be more specific. Say you�re 60 now and woefully unprepared to retire in five years. You lost your savings or never had any. What do you do? �Give up� is not the answer. It is entirely possible, even likely, that you�ll be physically able to work for another 20 years. That�s an entire career in and of itself. It doesn�t have to be decades of drudgery, if � here�s the key � you plan ahead. Financial planning works best when you have a lot of lead time. Compound interest takes years to do its magic. 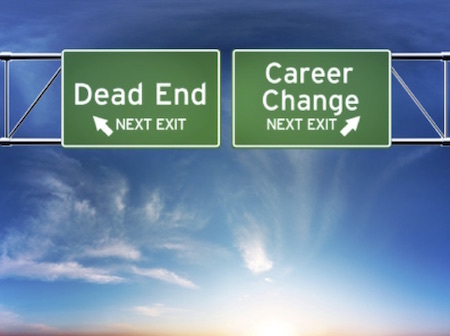 Career planning is different. It works best when you can act immediately. Take a deliberate approach and you won�t have to settle for a low-paid service job. So, if you�re behind the retirement curve, here�s what to do. � Figure out what kind of work fits your aptitudes and circumstances. It may be different from your previous career. That�s OK.
� Acquire any necessary education or credentials. � Build experience and contacts in your chosen field before you actually enter it. � Push the start button. The people I know who have taken this approach all describe the same experience. Step 1 is a kind of attitude adjustment, at first painful but then exhilarating. Something clicks, and they suddenly have more �life� ahead of them. They stop thinking about the leisurely rounds of golf and vacations they will miss and instead look forward to their new �encore� career. Of course, sooner or later you will still reach a point where your health makes work too difficult. But then again, maybe the medical miracles I see coming down the path in the near future will extend your work span along with your lifespan and health span. Work, if it�s something you enjoy, is not a burden; it�s a blessing. Whatever you�ve done all your life, you have valuable experience and knowledge. You can apply it to a new career, build savings, and avoid boredom all at the same time. Action is the answer to angst. The reality is, my simple solution won�t work for most people. Given the data we have looked at, is it any wonder that more and more Americans are increasingly anxious? Especially Baby Boomers? They want change because they feel (correctly) that the country is headed in the wrong direction; and when someone says here�s an easy solution and blames all the problems on some other group or factor (whether it�s the rich or illegal immigrants or trade or bureaucracy or � pick a scapegoat), they are speaking directly to the anxieties people feel, and that message drives polls and elections. Some see Trump as the culmination of this expression of anxiety. I think that�s a simplistic and wrong explanation. Trump is not the culmination; he is the harbinger of a coming age of increasing anxiety in response to an even more volatile economic, social, and political climate. We are one global recession away from being in the situation that Greece found itself five years ago: They were left with nothing but bad choices. If you think the stress level in America is high, visit Greece. Or any country in Southern Europe, for that matter. When the average American or European or even Chinese thinks about retirement, there is angst, and the level of angst is increasing. Even though I can cite reams of data showing how the world is a better place to live than it was 100 or 50 or 20 or even 10 years ago, it�s your own personal situation that you are faced with. You don�t get to live the �average,� it�s-getting-better-for-everyone experience. And growing angst is driving political polarization in countries all around the world. Republicans fantasize that we can go back to the �80s and President Reagan and implement the same policies he did and get the same results. Democrats fantasize that if we could just tax the rich more, things would all work out. And I use the word fantasize because unrealistic fantasies riddle thinking on both sides. Reagan had a massive demographic wind at his back; and yes, the policies he chose to put in place were the right ones at the right time, but we are no longer living with those demographics or that debt situation. And taxing the �rich� in order to spend even more will only slow down growth and opportunity for ordinary people on the street. The real solutions are going to require massive compromise on the part of both major parties in this country � which doesn�t seem to be in the cards. Which means we are going to keep bumbling down the same path until we find ourselves up to our eyeballs in a crisis, with no good choices. Gentle reader, if you have been reading me over the years, you may have come to believe in the correctness of the statements I made in the previous paragraph. What I�m telling you is that it�s not the end of the world for you if you take control of your own future. You cannot let yourself be subject to the slings and arrows of outrageous fortune. Your own personal future can be one of relative comfort with the ability to help others. Which in the future is about as good as it�s going to get for the vast majority of us. Tuesday I start an 8-day �road trip.� I fly to Washington DC and get in early enough to have dinner with Andrew (Andy) Marshall. Andy is 95 and was the longest-serving government employee in our history, appointed by Nixon in 1974 to run the Office of Net Assessment for the Secretary of Defense and reappointed by every president until he retired in 2015. His job was to think about the future and plan for what the world might look like 10 to 20 years out. He is probably the greatest inferential futurist on the planet. And by that, I mean that he can take random sources of data that don�t make much sense to you and me and discern patterns. When the State Department and the CIA were telling us that Russia was an economic powerhouse and was going to become as big as the US, he looked at all sorts of odd data and said, �They are going to fall apart.&rdquo ; He correctly identified Russia as a paper tiger, spending 30% or more of its budget on defense as its income fell. He and James Schlesinger figured that out way back in the �70s. The State Department and the CIA were clueless until it all came down around Moscow�s head. Ditto developments in China. Ditto every major Defense Department realignment that happened for 40 years. Andy had a retirement party last year, and I was surprised to be invited. It was attended by a lot of famous former secretaries of state and even vice presidents, as well as some of the most fascinating individuals I�ve run into. Andy tends to pick up eclectic friends and colleagues. 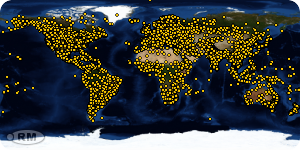 (I think that�s the polite word for them.) If you are seeing what everybody else is seeing, you�re probably not seeing the right things. For whatever reason, Andy has let me come into his world, has invited me to weeklong think tanks of the Naval War College, and sits and answers my questions patiently. I treasure our times together. He never willingly sought the limelight, purposely staying in the background, but the number of famous people who benefitted from his tutelage and went through his office is staggering. His biography is called The Last Warrior: Andrew Marshall and the Shaping of Modern American Defense Strategy. Then, with that preparation, I go the next day to George Friedman�s first annual Geopolitical Futures Conference, at the Army and Navy Club. I will be an attendee, sitting in the back of the room absorbing information and trying to figure out who I�m going to drag to dinner to glean more insights. The following morning I fly down to Atlanta, where I�ll meet Shane and spend the evening having dinner with our old friends Martin and Margie Truax before heading off the next day to drive to Augusta. I have always wanted to go to the Masters and was lucky to be invited to attend this year. Evidently there are rules about what you can write in public about who you shared the Masters with and what your experiences were. The rule seems to be that you can�t say anything much. So I�ll just say that I expect to have a great deal of fun and hope to see some wonderful golf. Then Monday Shane and I drive back to Atlanta; she heads back to Dallas; and I fly to Tampa Bay to have dinner with Patrick Cox and some friends. The following day is full of intense meetings with some of the most cutting-edge biotechnology researchers anywhere, along with a few major investors. Patrick and I are trying to encourage the birthing of technologies that will physically turn our genes younger. It is our belief that much of the antiaging research that is coming out of Silicon Valley is missing the point. They are trying to start from scratch with a few new ideas here and there, and maybe they�ll be successful. But what Patrick and I are seeing is already out of the lab, past the point of �discovery,� and simply needs to have the funding to turn these discoveries into practical applications available to us all. It�s not a cheap endeavor, but at the end of the day, what�s the Fountain of Youth worth? I have no doubt that w e will drink from that fountain in the coming years. I just hope it�s within my lifetime. Yes, I�d like to live to be several hundred years old. I want to explore not only our own world but to go into space and explore other worlds. I find it somewhat amusing to talk to people about living a greatly extended lifetime. I constantly get the retort, �I don�t want to live that long.� My quick rejoinder is always, �Are you actually that bored with life?� The answer is almost always no. And then I ask, �And what makes you think you will be bored 100 years from now? Think you will have figured it all out and been everywhere, done everything?� Give me a younger body who various parts work as they did in my early 20s, along with what I know now, and I can readily imagine an exciting and fulfilling future. Of course, we have to get through the rather massive problems facing our society and our economy. and gods only know what our government is going to do to us. So we Muddle Through until we can break out. It�s time to hit the send button. Have a great week!